There are over 50 million Latinos in the United States, the largest minority group in the country. Their numbers grew by 43% in the last decade, and it’s estimated that by 2050 one in three of the US population will be Hispanic. What does it take to lead a varied and vibrant people who hail from twenty-two different countries? And what can leaders of all cultures and ethnicities learn from how Latinos lead? 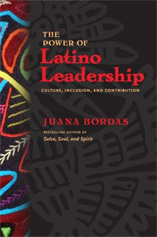 Based on her personal experience as a longtime Latina leader Juana Bordas takes us on a journey to the very heart and soul of Latino leadership. She offers ten principles that guide Latino leaders and features numerous examples of these principles in action. Our nation is quickly becoming a multicultural cornucopia. Tapping the potential of our changing demographics requires a leadership approach that resonates with our growing diversity. 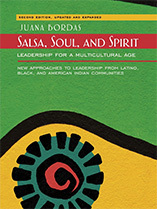 In Salsa, Soul, and Spirit, Juana Bordas shows how incorporating Latino, African-American, and American Indian approaches to leadership into the mainstream has the potential to strengthen leadership and inspire today’s ethnically rich workforce. Download these FREE articles – a GIFT for you from Juana! Stories and rituals can enhance and enliven leadership and diversity discussions by offering a multicultural perspective and encouraging people to think in new ways. Each story has a moral or lesson which can stimulate discussions on values, ethics, and the role leadership plays in diverse cultures. CD – “The Prophesy and the Promise,” captures four leadership stories in a lively and engaging manner. Featuring the voices of actress Yolanda Ortega and Leadership Expert Juana Bordas, the CD can be used to spark discussions and to connect to the leadership traditions of ancient cultures. Especially designed to motivate young Latinas, Juana has put together a journal on leadership, culture, and personal development. The workbook encourages young Latinas to stay connected to their roots, understand their special talents and unique gifts, and shows them how making a contribution and serving others can prepare them to actively plan their future and achieve their dreams. Journaling is a pathway to a deeper understanding of self and provides insights into one’s leadership calling. While this Journal was designed to assist Latinas assess strengths, reflect on their background, and delve into the inner process of leadership, it has many useful and creative suggestions on how anyone can grow into their leadership potential. Included are specific areas tailored to women’s leadership and useful insights to the dynamic and vibrant Latino culture. Passion and Power assists people understand and refine their personal purpose. It utilizes the Native American Vision Quest as a metaphor to unfold “purpose” and connects to Robert Greenleaf’s work on Servant Leadership. Purpose has been defined as a person’s “life work” and accomplishing what in some cultures is “the job you were sent here to do!” Finding purpose is an inner search — it requires standing outside oneself, discerning the patterns that give texture and structure to one’s life, and reflecting one’s life experiences and background. This workbook assists in this process.